Lean To used to cover decking area in garden makeover. 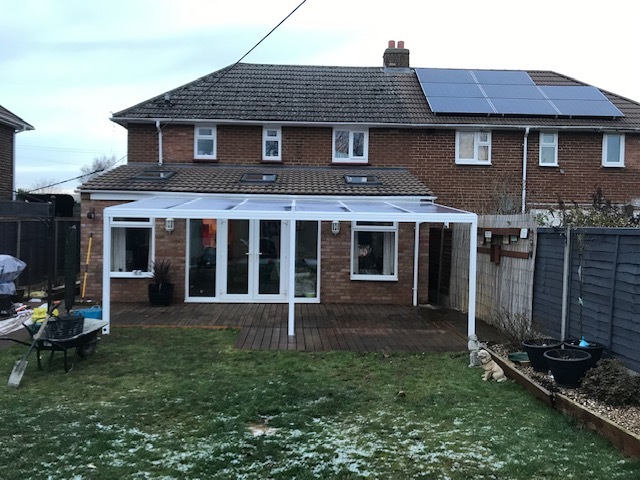 Check out our latest build of the Lean To canopy system used as a decking cover. 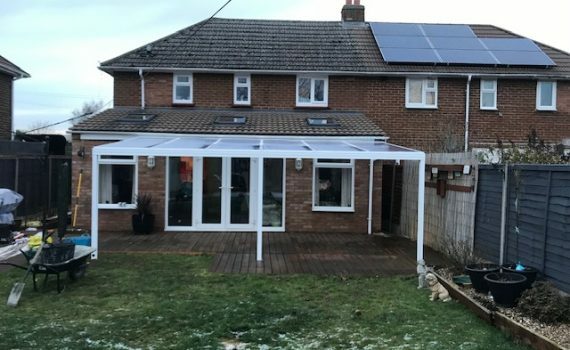 Featuring the White frame finish with 16mm clear polycarbonate roofing. The decking was carefully lifted and relaid around the leg support footings. As our team make sure the finish is so neat, it looks as though the legs flow seamlessly into the decked area. In this case with fitting to an extension the height was lower than a standard property. However, as the wall plate can be attached to the fascia board this was no issue for the fitting team. This is the perfect time of year to plan your own canopy project. Because we are so flexible with the dates for delivery and installation we can arrange the timeline to suit you. Imagine having your own bespoke canopy in time for spring. Just want to say how pleased I am with my new veranda. It’s fantastic and I know I will get many hours of enjoyment from it. All I need now is some good weather not snow, which we have at the minute. I feel like a child with a new toy who wants to get out and play !! Dave did a brilliant job in the freezing temperature yesterday, even cleaning up at the end. We work hard so that you can sit back and enjoy your canopy. It means so much to know our efforts have paid off. If you would like to feel like Glenys contact us today for a Quote and get your dates booked in!